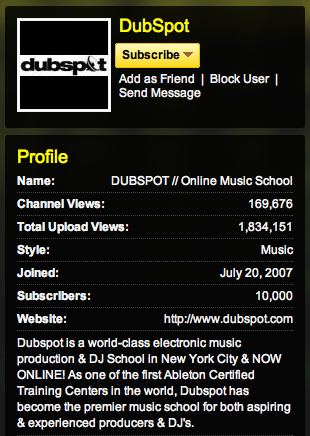 Dubspot’s YouTube channel is 10,000 subscribers strong! To celebrate the occasion, we’re giving away a Dubspot Online Level One course to one of our subscribers, because we are grateful for every single one of them. As we announced last month, Dubspot is going global; we are opening our classroom to the world, offering electronic music production and performance courses to anyone, anywhere! The lucky winner can choose from any level 1 course in programs including Ableton Live, Synthesis & Sound Design, Logic Pro, Reason & Record. The winner will be announced Monday, January 3rd, 2011! 1) Log on to our Facebook fan page, and reply to our post with your favorite Dubspot YouTube video. Please include the video title along with the link. 3) Leave a comment on the video titled What Is Dubspot, and let us know what you would like to see more of. 4) Leave a comment at the bottom of this blog-post, tell us why you love Dubspot’s YouTube channel and what you would like to see more of, and also like and tweet this blog post. The dubspot youtube channels is my first option to learn more about dance music tips and tricks. thanks very much! We’re working on some more stuff for Reason/Record, stay tuned. i love dubspot and i read the blog all the time, but i would like to see more pro tools usage, and on how to be a sucsessful producer/dj in the sense of buisness and stuff aside from technical knowlege. You guys are just great. All your videos are fun and entertaining to watch and when the videos end I feel like I learned more then I did from school or college. I would personally like to see more S4 videos like I asked on your “What is Dubspot” video. But im really happy with any videos you guys plan to make. I just love the content that dubspot provides. A year or two ago I was trying to figure out how I could get to NY to take the classes. Now with the on-line courses I don’t have to worry about it. A true dream come true. Thanks Dubspot! The Dubspot YouTube channel is a wonderful resource. I love the Ableton workshops and the artist interviews. It is very inspirational watching a professional just sit down and speak their mind. I would love to see some general tech tips for Ableton (and other softwares.) Sometimes, I like to learn more about what I’m using to make music than the music I am making. Thanks for everything already though, Dubspot! @ben thanks, really glad you find them helpful. Thanks OC! Really glad we could help. Thanks! We’re planning some new stuff for the S4, any specific requests? We’re working on some of that business stuff for our new online courses, it will be integrated into the overall curriculum. As far as Pro Tools it’s not a top priority for us right now but maybe in the future. Dubspot is simply AMAZING! Through your tutorials I have stepped up my scratching game, learned about what can be done in Ableton and Traktor, and got some great inspiration to makes some killer mixes! The videos are funny and informational, breaking things down step by step. We definitely need a program like this in California!! Thanks for all the tips! I love the YouTube channel because it gives everybody the opportunity to view some tips/techniques even if they do not have the money to sign up for a dubspot class. Its great all the exposure you are giving this whole new genre of DJ’ing/producing! I wish you offered Dubspot classes in California, maybe San Francisco or LA! I would like to see more videos showing how to produce specific genres of music (like electro-house and dirty dutch) using Abelton. Keep up the good work guys! Thanks Matt! We do have some plans to open in LA, we’re hoping for late 2011 but are still working out the details. Watch the blog for more detail on that. I really dig the Dubspot Youtube channel because there are a ton of great short tutorials regarding a variety of topics. Some of the Shiftee tutorials have been very informative (and entertaining! Who knew math majors could be so much fun? ), and some of the ableton live tutorials have really helped me with some new ideas. Thanks! We’ve been working hard on the YouTube channel, glad you found it helpful! Let us know if you think of something you’d like to learn more about. ‘What Is Dub’ is the one for me. Alot of people don’t know or understand the contribution of this music to all the different elements of Electronic Music today. What an awesome video to help preserve this knowledge. Keep up the great work ! For anyone starting out in Electronic Music Production there is no better place to start than Dubspot. I’m using Ableton live 8 for music production and after watching numerous videos on youtube I came across Dubspot – all I can say is these guys are enthusiastic about what they do, with detailed lessons by certified trainers. When I started looking for video tutorials I spent ages wasting time looking for quality tutorials and when I came across Dubspot for the first time – Yea Boiii!!! Jackpot!!! !